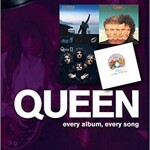 Share the post "Book review: QUEEN – Every Album, Every Song (On Track) by Andrew Wild"
Nicely timed by this new publisher Sonicbound (future titles in the series include ones on Blue Oyster Cult, Yes and Roy Wood & The Move), a book on Queen and their music as the film ‘Bohemian Rhapsody’ opens in cinemas. The author Andrew Wild sets out to do as the title suggests and review every Queen album and song – he includes B-sides, rarities and ones that were rumoured to be or have been recorded, yet have not been officially released. On top of this he analyses twenty songs based on listening to the original 24-track master tapes - he does it almost second by second at times and this approach does come over as perhaps too analytical taking some of the magic away from the music. Any book like this will be down to the author’s own opinion of the music (for the record I think ‘Keep On Passing The Open Windows’ is one of their best songs which the author thinks most Queen fans wouldn’t include in a best of list!). The author also uses already published interviews to add context to an album’s recording, with enough facts to keep interest going. Wild gives some much maligned albums like ‘Hot Space’ another chance (it has got better with time), adding in little touches of humour here and there. It does cover all the Queen albums, including the Queen + Paul Rodgers ‘The Cosmos Rocks’ – although that album only gets a brief overview and to be fair it was a pairing that worked okay in a live environment, less so in the studio. A run through the solo works and offshoots like Roger Taylor’s The Cross would have been worthy additions. A handy intro to those only familiar with the band’s well known songs, complete with chart positions for singles and B-side details. This entry was posted in All Posts, BOOK REVIEWS and tagged Andrew Wild, book Queen, Brian May, classic rock, Every Album Every Song, Freddie Mercury, John Deacon, melodic, On Track, pomp, review, rock, rock 'n' roll, Roger Taylor. Bookmark the permalink.